Whether it is our library, our natural garden, the wetlands, our proximity to the Richardson Bay Wildlife Preserve and the nearby Audubon Nature Center, students at Strawberry have a wealth of resources and opportunities to enrich and deepen the learning experience. Our Garden and Wetlands are maintained by kids and parent volunteers. The Strawberry Point PTA hired Naturalist and Environmental Education teacher, Kiea Spake-Wright, to teach the children about the garden and environment. You can see Kiea's blog here: Environmental Science and Garden News. Unique in the Mill Valley School District, Strawberry Point School is the only school with natural bay wetlands on the school grounds. The school nurtures this invaluable natural resource as a living, outdoor classroom. In addition to the science of wetland ecology, students learn a variety of subjects within an ecological context that helps to instill a deep appreciation and stewardship for nature and the environment, and a desire and commitment to work toward a more sustainable world. The school's garden and plant nursery provide our students the opportunity to explore ecology in a hands-on, environmental laboratory where they obtain a deeper understanding of our relationship to food and nature. This program, supported by the School District and the PTA, is a requirement to maintaining our playing fields. A little over a year ago, the school had no playing field. In the 1990's the playing field fell into disuse when the school temporarily closed, and was classified as a degraded seasonal wetland. In order to re-open the playing field, a very complicated permitting process and comprehensive mitigation program was required. This resulted in seven years of volunteer work by dozens of PTA members, and culminated in the restoration of the playing field, and the creation of 0.7 acres of new tidal and seasonal wetlands, at a total project cost of just under $500,000. Funds were raised by the PTA and the community. In order to obtain approval from various agencies, the field and wetlands project included a comprehensive environmental education program for the students. It's not just a benefit to our students, it's a requirement to keeping our field, and the environmental education program must be supported by you, the parents. We also need parent volunteers in order to continue our wetland mitigation efforts to maintain the wetlands, and introduce native plant species. 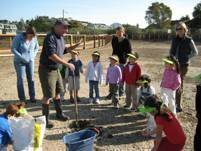 What does the environmental education program offer? Naturalist Educator Kiea Spake-Wright is on campus 30 hours a week conducting hands-on weekly sessions with each class. Funded by the PTA. Field Activities Coastal plant ecologist Peter Baye, our regular teachers, and parent volunteers conduct field classes in the wetlands and garden. Worm bins, composting, vegetable gardening, plant and animal identification are only a few of the components of these outings. The Green Team Recycling Program This is a comprehensive recycling effort run by students and parent volunteers to recycle and compost all lunch materials. Field Trips Visits to the Richardson Bay Audubon Center, Marin Headlands, the Bay Model, and Ring Mountain are a few of the activities that are conducted off site. What can I do to support this wonderful program? Everyone is encouraged to participate in our program and help us be stewards of our environment! Parent volunteers are needed to assist with any of the education programs list above, to help maintain the wetlands, and to plant native species as part of the wetlands restoration. Parent volunteers are needed for each classroom to assist Kiea and the weekly environmental field class. Wetlands and garden work days are scheduled every few months to help maintain the garden, remove invasive species and improve our wetlands. Over the past five years, our wetlands has been planted with hundreds of seedlings to provide a diverse and thriving habitat for our local species. Like to garden? Work in the outdoors? Sign up!